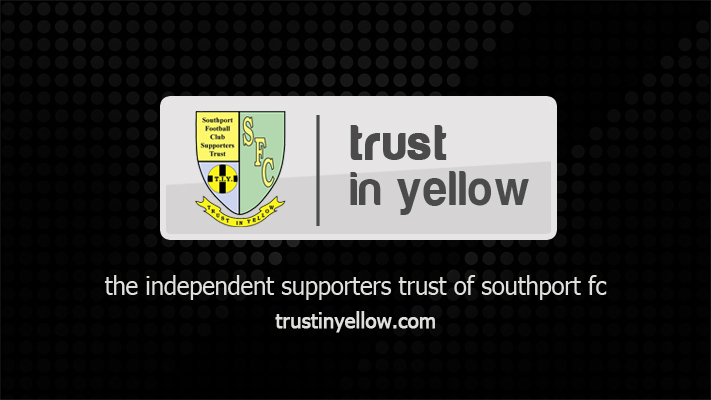 Trust in Yellow has been very pleased with the response to the fundraiser launched with midfielder Luke George and Diabetes UK. 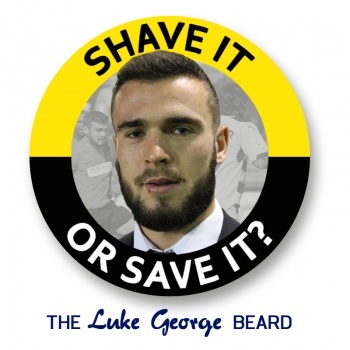 There is now less than a fortnight remaining to make a donation, as the total amount raised will be added up at the end of the first week in March to decide whether Luke's beard is shaved or saved. The Trust is giving fans the ultimate say on whether Luke’s trademark beard should stay or go while also raising funds in the process. Supporters are being asked make a donation based on whether they think the beard should be shaved or saved, and whichever raises the most money by 8 March will win. There are only two home matches remaining during the campaign, so please donate in person or online using the details below. 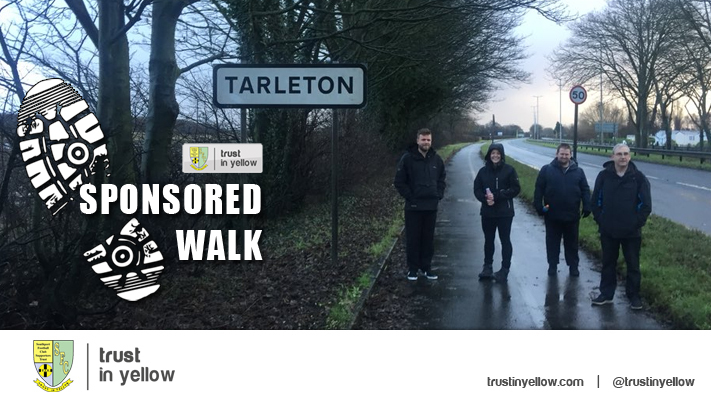 All funds raised will be split equally between the Trust and Diabetes UK. The campaign has received good publicity in the press and was also discussed during Luke's interview with ITV Granada Reports in their feature ahead of the FA Cup match against Eastleigh. Regardless of how you donate or which option you choose, the funds will be split equally between the Trust and Diabetes UK. You can make a one-off donation or simply bring in your loose change whenever you pass on a matchday. 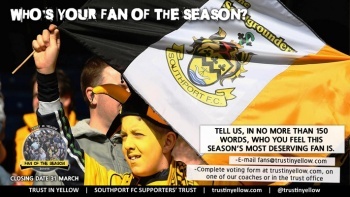 Following the success of the first competition last season, TIY is pleased to announce that it is again running a 'Fan of the Season' competition. We are looking to recognise a supporter who has made that special extra effort to give loyal support to the players and team at matches in season 2014/15. So this is not just about that band of fantastic people who give hours of their time in voluntary work for the club and without whom the club couldn’t be successful. We are sure the club has ways of recognising their efforts. Our 'Fan of the Season' competition is for any supporter who has gone that extra mile this season in following and supporting their team . 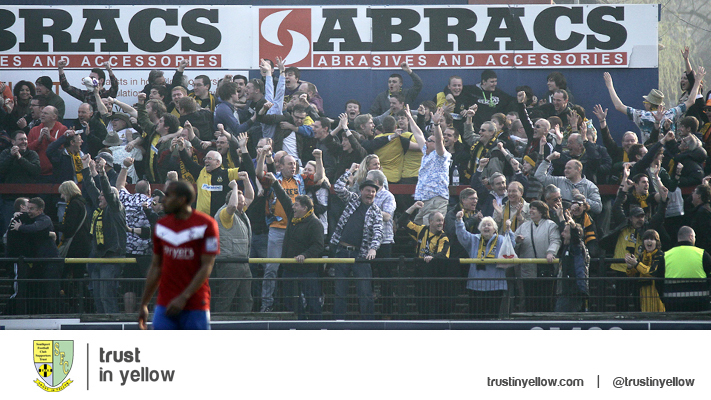 Do you know someone who you think has shown a special passion for the club? 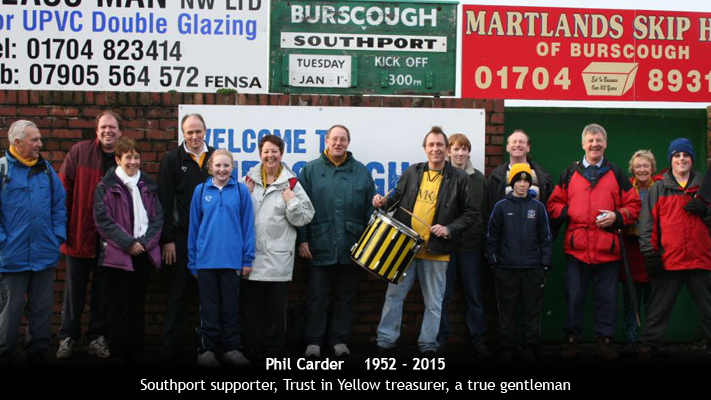 Is there someone within the Southport FC fan community who is an unsung hero deserving recognition? If you know such a person then let us know. Email fans@trustinyellow.com, telling us in no more than 150 words how you have been inspired by someone else's commitment. Alternatively you can download the NOMINATIONS FORM HERE and return it to us in person at the Trust office or club shop, by e-mail or by post using the details on the form. The closing date is TUESDAY 31 MARCH. The winner will receive their trophy at the end of season presentation evening when the various players’ awards are given out. Defender Luke Foster has been voted the Trust in Yellow Player of the Month for January. The Southport captain, who has had an excellent season since joining from Lincoln City last summer, came out on top in the supporters’ poll. Foster has been runner-up for the award in a number of months this campaign and picks up the award after another set of commanding performances in January. 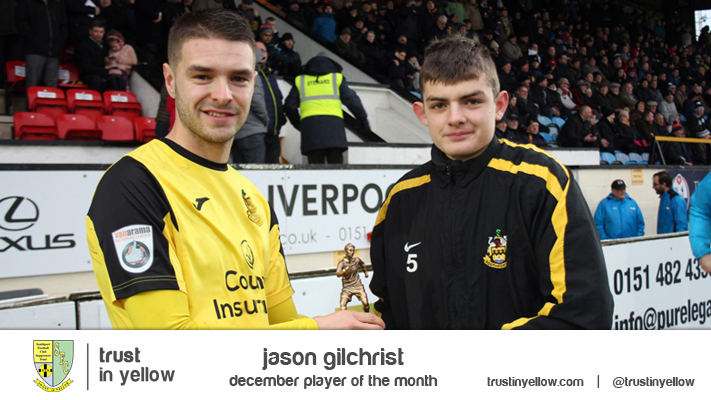 Foster was presented with his award by Southport fan Harry Hopkins ahead of Saturday’s draw with Macclesfield Town. Foster joins Richard Brodie, Paul Rutherford and David Raya Martin in having won the award this season. Supporters will have the chance to vote for February’s award at the end of the month. Southport's next away game is at Forest Green on Saturday 28th February. The coach will depart the Merseyrail Community Stadium at 9.30am. To book phone Alan Scarisbrick on 07980911693. Prices will be reduced if there are sufficient bookings.